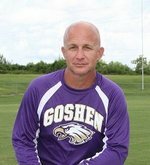 I am the Boy's Physical Education Teacher, Athletic Director and Head Football Coach for Goshen High School. I am a graduate of Goshen High School and Troy University. I have been teaching in the Pike County School System since August 1992. I am married to Stephanie Dykema Snyder. Together we have two wonderful boys, Brock and Will. Both of my children attend Goshen High School. My family lives on my family's farm in the Little Oak Community just outside of Goshen. We are members of the Little Oak United Methodist Church.